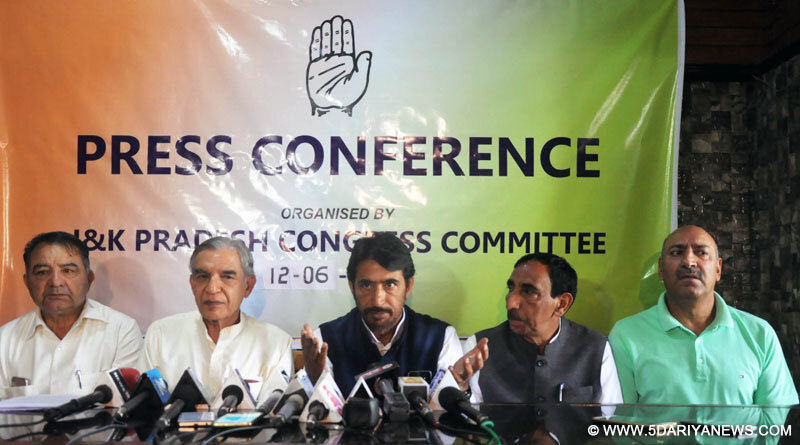 Congress Monday said that the BJP government has failed to rise above party lines to govern the Jammu and Kashmir state in alliance with PDP.“BJP has not come above its party line and propaganda in Jammu and Kashmir while ruling the state in alliance with PDP. This has resulted in worsening security situation in the state,” Senior Congress leader and former Railways minister, Pawan Kumar Bansal said.As per KNS correspondent, Bansal said that because of the BJP’s party interests, tourism, economy and education has deteriorated in the state.Bansal said that security situation in the country has worsened and citizens are feeling insecure to live after the BJP government took over in the country.“Security, both internally and externally, has worsened. An atmosphere of insecurity has been created where citizens feel threatened. Vigilantes have been let loose which are attempting to decide dress and eating choices of people, Bansal said, while addressing a press conference at Pamposh hotel here.“The chief ministers and leaders of BJP are giving statements which have created fear psychosis among the people in the country,” he said.The press conference was a part of series of media interaction programs started by Congress to counter the BJP programmes launched by the party on its three completion of the government.